So folks, how you doin’? I think it’s noticeable that of late we haven’t been blogging as much or communicating as much apart from the obligatory post every now and then. We are definitely more prolific on our instagram accounts as that is less of a chore than actual writing. Indeed, I think I have been or had been suffering from what is commonly known as blogger fatigue. Writing and churning up a blog post every couple of days was tiring me out and it was turning a fun hobby into work. The more committed to our blog we became, the harder it was to stop taking it seriously. The harder it got in separating blog life from actual life. We needed a much deserved break. Work itself has become rather stressful and our personal life has taken on an exciting albeit more busy twist. So we (me more so than The Boy) decided to kill two birds with one stone. Take a break from regularly posting up stories and to enjoy things one at a time as per normal everyday people. We also decided to take a whirlwind eating trip to recharge our batteries and to reacquaint ourselves with why we loved doing what we do for our blog, namely travelling and eating. So we took Madam Mummy on an early 70th birthday trip to Penang and Singapore via Kuala Lumpur. To demonstrate how whirlwind-ish it was, the trip was broken up into 3 days in KL, 2 days in Penang and 2.5 days in Singapore. In this first of our Layover posts, we have compiled a list of food places to visit based on their proximity to one another. Just a little bit of context as to why we visited some of these places. I come from a third generation Malaysian Chinese background (my great grandparents migrated to Malaysia from China in search of a new and better life) which settled in the Pearl of the Orient, otherwise known as Penang. As mum’s 70th birthday is fast approaching, it was only logical that we would take her back to her hometown to rekindle her love for the city as well as visit the many haunts of her childhood years and finding as many restaurants and hawker food stalls which she grew up with that was still available. 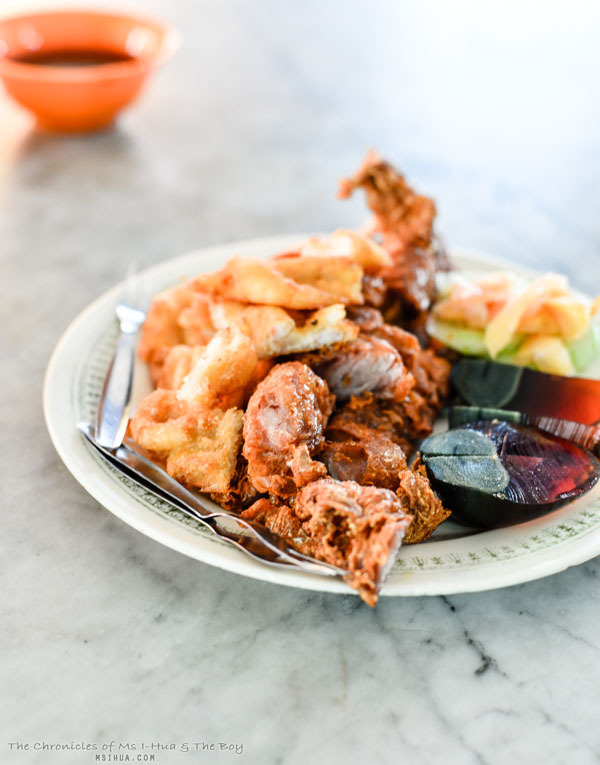 Not only is he treasured in Penang, he’s been known to frequent Singapore as part of their hawker food stall line up in their Annual Penang Food Festival in York Hotel. We always, always start with one order and finish up with either two or three orders. This time however, as we were aiming for maximum impact on kopitiam visits, we kept our orders to a minimal and only had two serves. 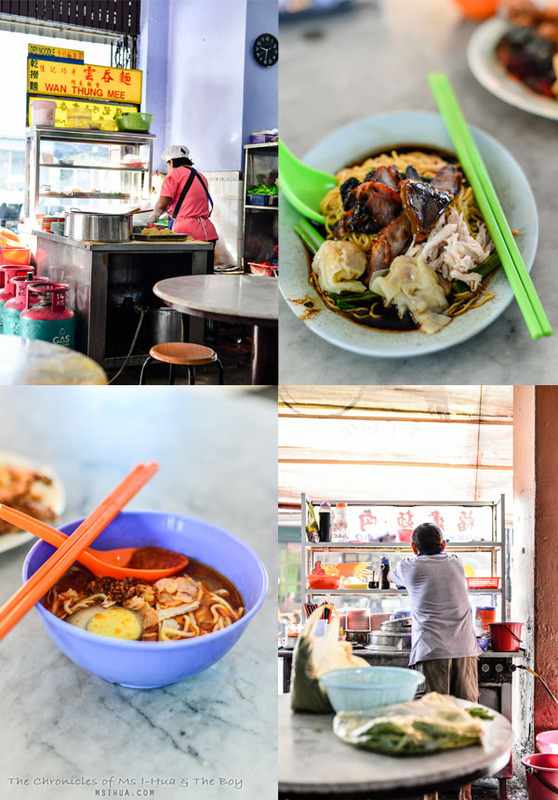 We also sampled the Wan Tan Mee and the Penang Hokkien Mee (Har Mee) at the kopitiam. We made a mistake on our first day when we arrived on the Monday. 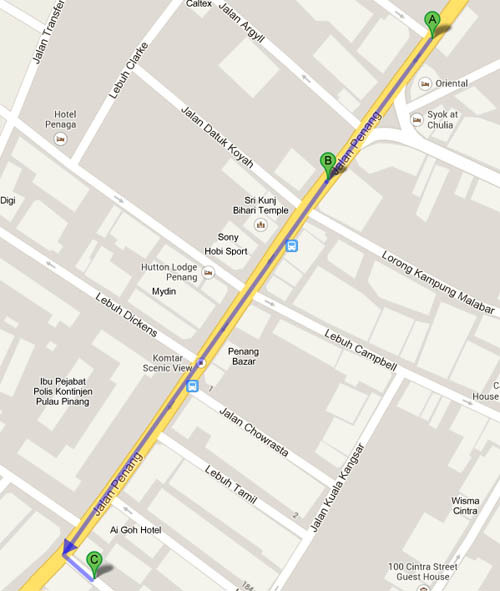 We went straight to Kheng Pin Cafe without realising that it was close on Monday’s. Disappointed, as we were really craving crispy things, mum being the great tour guide she was, walked us back down to Line Clear, a Nasi Kandar shop made famous worldwide by Anthony Bourdain’s No Reservation. The place was packed when we visited just before lunch time. The ordering system was pretty self explanatory, as you wait in line, the drinks counter asks you for your order. 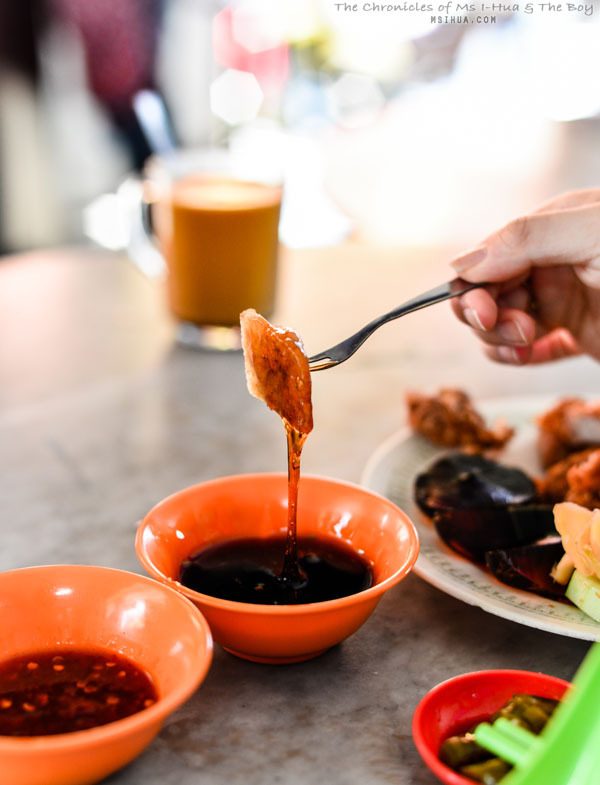 Once you reach the trays of food, you simply point your finger at the dishes you want to try (the lovely old man serving us spoke in Cantonese which completely threw me, even when it shouldn’t, but I just stared at him and answered back in Malay! It was quite funny). Once you take your plate away from the cashier to sit down, another staff comes up to you and clarifies your drinks order and brings it out to you in 2 seconds flat. Efficient! 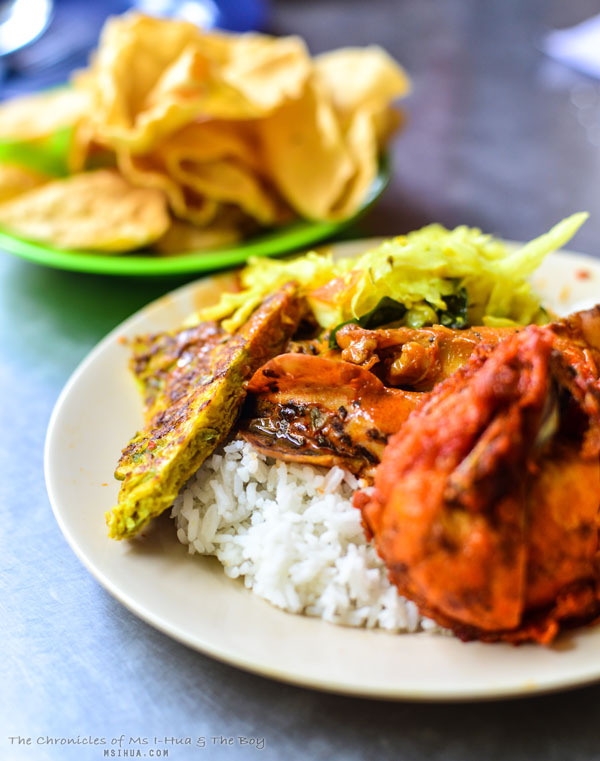 Was the Nasi Kandar worthy of its global fame? It sure was tasty. The three of us shared a gigantic plate which set us back about RM18, but we had squid, chicken, egg and veggies. So delicious. 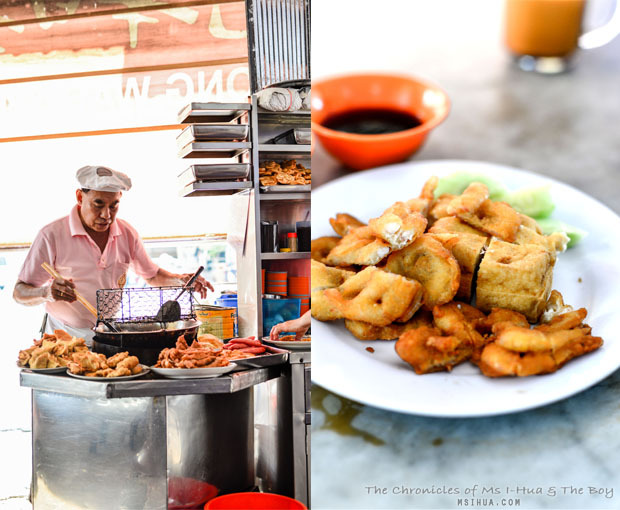 For refreshments and to quench your thirst from the hot sun (believe me, I didn’t think it would get quite so hot and was sunburnt from walking along the entire stretch of Penang Road), take a short walk down Penang Road and turn into Lebuh Keng Kwee. You’ll know it as soon as you turn into the lane that you’ve hit the right spot. 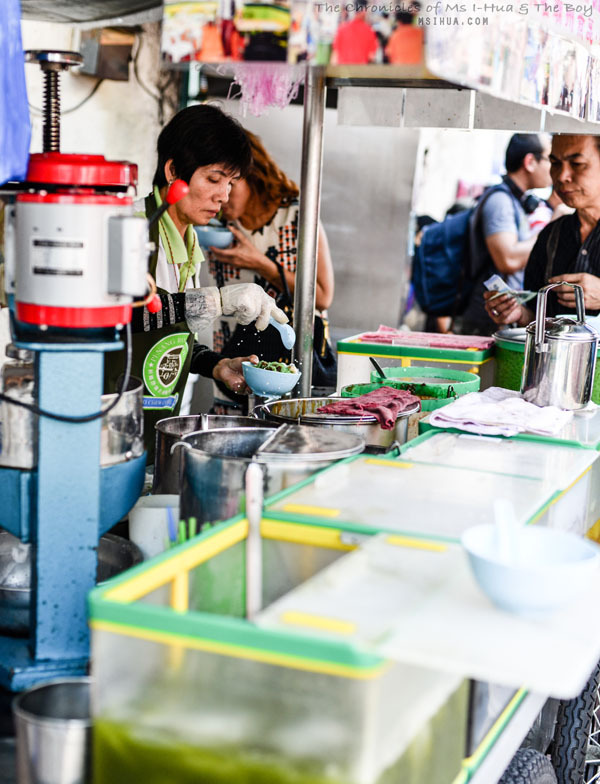 The cendol stall which you want is the one on the right, next to Joo Hooi Restaurant (or the busier one with a crowd standing around it eating quickly from bowls under the umbrella). 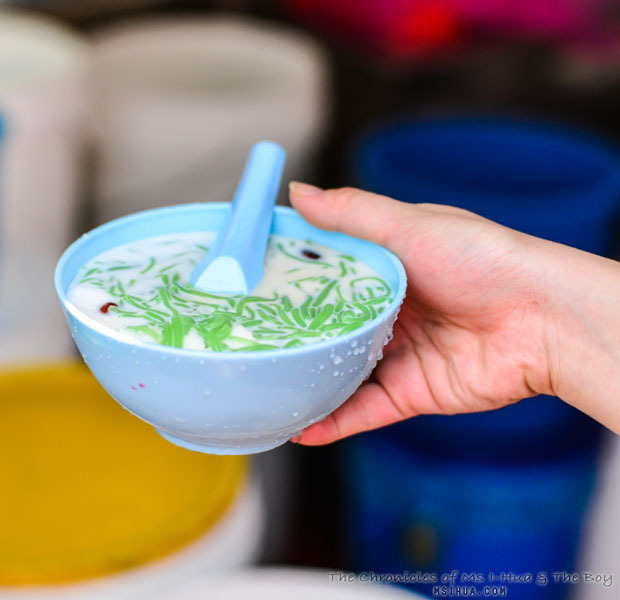 A beautiful bowl of ice-cold cendol will set you back RM2.30. Standing there and watching the stall owners at work on super speed is a sight to behold! 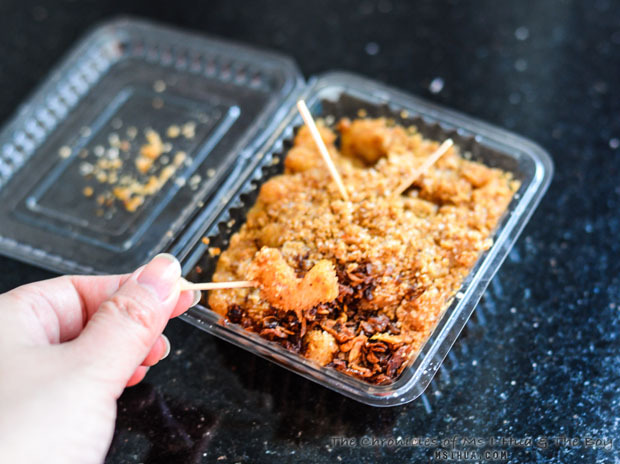 Also just further down from the Cendol stall, I found a muah chee (glutinous rice snack with sugar and peanut) stall that had an interesting twist to the muah chee, it came served with fried shallots! Interesting, but I think I prefer my muah chee being a dessert and not tainted with the savoury taste. So we hope you are having a fantastic drool all over your keyboard or mobile devices. Keep the encouragement and words coming! We couldn’t do it without your love and support. This is exactly why I’m taking a blogging break. It hasn’t been fun for many months now, and I was starting to dislike myself for posting things my heart wasn’t in. But I wish I could’ve flown to Malaysia to recharge, like you! What are those dark red slices on the plate in the main photograph? Dark red slices? I’m assuming the century eggs?